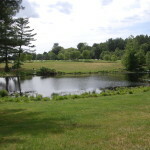 Great Brook Farm State Park - Carlisle, MA - Take a day trip! Fishing Pond and Group area. 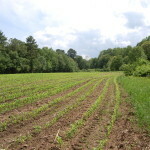 Hiking – Great Brook Farm boasts a large network of trails across the park. Horseback Riding – Great Brook Farm is a popular spot for horseback riding with a large portion of their trail network open for horseback riding. 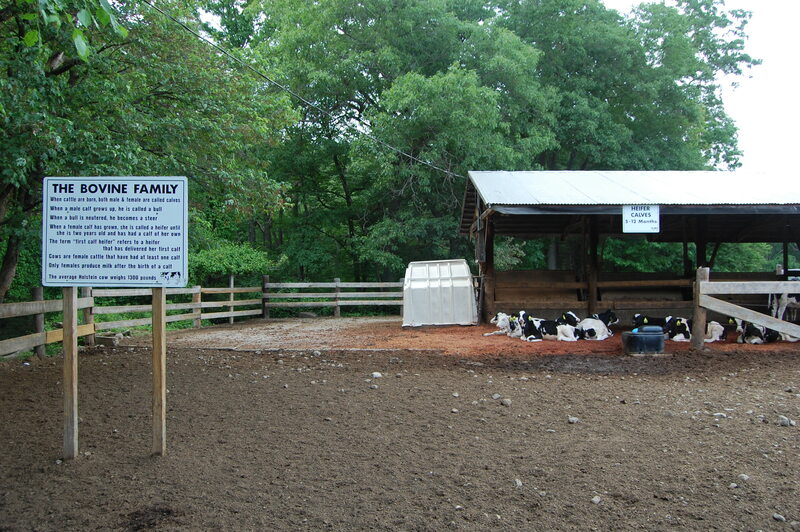 Farm Animal Area – The working dairy farm includes an area with farm animals that you can buy food for and feed and pet. Smart Barn and detailed farm tour – The dairy farm uses a lot of advanced technology and tours are available to show off the technology in use and go into more details about the workings of the farm. Ice Cream Stand (seasonal) – During the warmer months milk from cows at Great Brook Farm is used to make homemade ice cream that is sold on property. 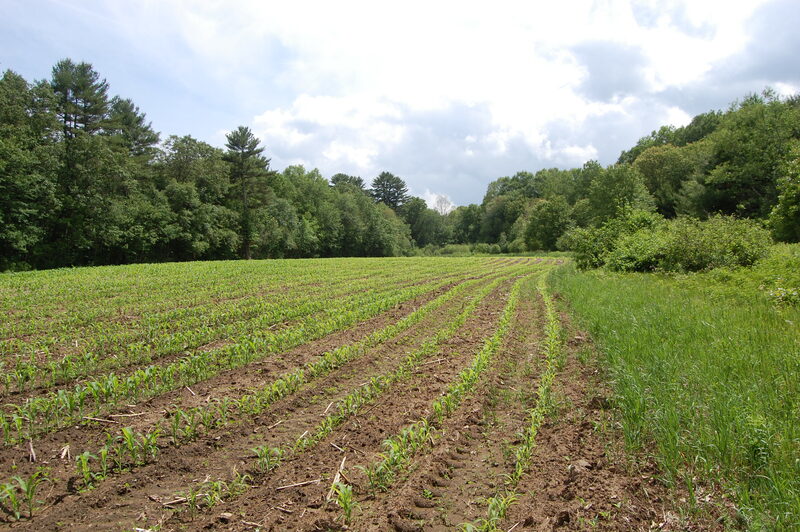 Corn field on a hiking path. 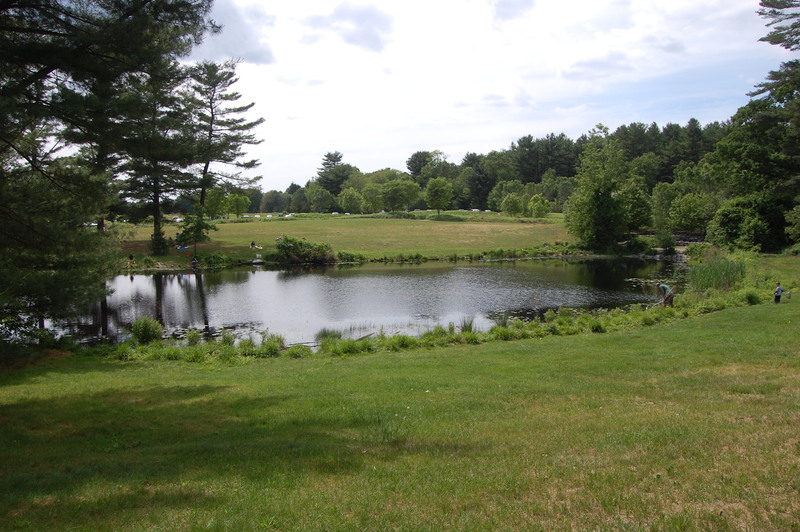 Group Area – Great Brook Farm has a large open field area and small shaded pavilion area that can be used by small groups – you should contact the park first to see if a special reservation or permit is needed. Fishing Pond – There is a small pond near the farm area and ice cream stand that you can fish in and is popular with families with smaller children for finding frogs and tadpoles. Canoe Launch – There is a canoe launch in the park and in Thanksgiving Ground Conservation Land – an adjoining piece of conversation land just over the town line in Chelmsford. Great Brook Farm has full facilities including handicap-accessible restrooms, an ice cream and snack stand, ski touring center and interpretive center. For more information about the park including a map check out the Massachusetts DCR website for the park – check out the winter or summer trail maps – depending on the season there are different rules for trail use.